pFriem Rauchbier (or Smoke Beer) uses the centuries-old process of drying its malted grains over an open wood fire. The result is a beer laden with smoky aromas of toffee, biscuit, and charred meat, with rich and robust notes of caramel, smoked cheese, and candy-like malt. If you think this sounds odd, fascinating and delicious, just wait until you try one! Before kiln drying dominated malted grain, all malts were dried by sun or open wood flame or a combination of both. The open flame from would impart a rich smoky flavor to the beer. Beginning in the 18th century, kiln drying of malt became progressively more common and, by the mid-19th century, had become the near-universal method for drying malted grain. Since the kiln method shunts the smoke away from the wet malt, a smoky flavor is not imparted to the grain, nor to the subsequent beer. Thus, smoke flavor in beer became less and less common, and eventually disappeared almost entirely from the brewing world. Certain breweries, however, maintained the smoked beer tradition by continuing to use malt which had been dried over open flames. Two brewpubs in Bamberg, GermanySchlenkeria and Spezial—have continued smoked beer production for nearly two centuries. Both are still in operation today. Both dry their malt over fires made from beechwood logs, and produce several varieties of Rauchbier (“smoke beer” in German). Rauchbier beers are light to dark brown, with quietly intense smokiness backed by malt in the nose. Malty smoke dominates the palate, which also sometimes finds fruity notes, and the beers finish dry. These beers are assertive and unique, and even most Germans find them odd. They are also entirely fascinating and surprisingly delicious. 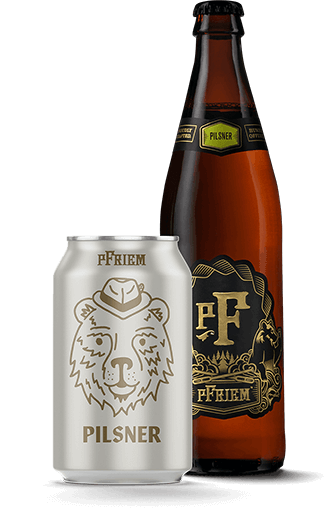 pFriem Rauchbier takes a traditional approach and uses a malt forward Marzen base balanced with 50% smoked beechwood malt. This beer has a light honey-amber color and pleasant aroma of smoke and toffeeish malt. The smoke character prominent, yet intriguing. The bitterness is restrained and sweet, candy like malt comes mid palate. Juicy malts are balanced by assertive smoky finish. Khaki foam on top of a deep tawny amber body. Smoky aromas of toffee, biscuit, and charred meat. Rich and robust flavors of caramel, smoked cheese, and candy like malt. Finishes with juicy malt, balanced by an assertive smokiness; very intriguing. Smoke and pork are natural compliments, so smoked pork is delightful with Rauchbierham, bacon, pork belly-smoked or not. Roasted chicken, BBQ meats, burgers, rich steaks, and smoked salmon. Onion stuffed with pork and capped with bacon is a classic dish with this beer. This beer works surprising well with Mexican, Chinese, and Thai food.